I received produce from Melissa's and a serving platter from Le Creuset for recipe development in conjunction with #FabulousFallBounty. All opinions are honest and my own. Delicious fall vegetables and chestnuts are roasted and then quickly glazed in a bit of maple and butter for a luscious side. It tastes amazing and sounds sinful but is a delicious and nutritious side dish. This week is going to be so much fun! We are celebrating the fall harvest and fall flavors and each dish is bringing something new and fun to the table. Melissa's was nice enough to send me a HUGE box of fall produce for recipe development. I knew it was coming but was still shocked at all it held. There were so many goodies. Some are fall favorites in our house and other things were fruits and vegetables we had never tried. What a fun excuse to broaden our culinary experiences and tickle our pallets. Roasting vegetables is one of my favorite ways to fix them. It is simple to prep and the roasting concentrates the flavors to make everything a little extra sweet. Plus those browned bits add a lot of flavor and texture as well. It's the perfect way to get that sweet and savory flavor while being super healthy. So I knew I'd want to roast some vegetables. To really drive that sweet and savory dance home, I picked vegetables that have some natural sweetness to them. My husband was mystified by the celery root when he saw it. He's not usually a celery fan, so he was dubious as well. Guess what? He liked it roasted! He was also a bit suspicious of the fact that I had left the peel on the delicata squash, but he liked that as well! To me pearl onions dress up a meal. Sure, sliced onions would do the trick. But who wants slices when you can have pretty pearls? The color variety even adds that little bit extra visual appeal. I added the chestnuts to the mix because it seemed like the thing to do. I figured the added nutrition and texture would be good, but honestly I didn't have the highest hopes for liking them. We had tried chestnuts over the open fire before and they just weren't our favorite. But the steamed and peeled chestnuts from Melissa's made them super easy to add, so why not? Delicious fall vegetables, roasted and kissed with maple and butter served up on a pretty Le Creuset platter. After the veggies were all roasty and toasty I thought I'd take them to the next level by coating them in just a tad bit of butter and maple syrup. It is totally not necessarily but whole heartedly recommended. Those chestnuts I wasn't so sure about? I was picking them out and gobbling them up like candy! I couldn't get enough of the veggies either! So if you are looking for a fun new way to put fall produce on the table, may I suggest you roast them up like this? It is delicious, nutritious and pretty to boot! The best part is you can sub veggies in to match your preferences. Just be sure to cut them in sizes that will cook in roughly the same amount of time. Preheat oven to 400 F and grease a rimmed sheet pan. Cut the ends off the onions and remove the outer papery layers. Peel the acorn squash and remove the seeds. Cut flesh into about 3/4 inch cubes. Slice the delicata squash in half and remove the seeds. Cut into about 1/4" slices. Peel the celery root and cut into about 1/2" cubes. Add cleaned and cut vegetables to a bowl along with the chestnuts. Toss with the olive oil. salt, pepper and thyme. 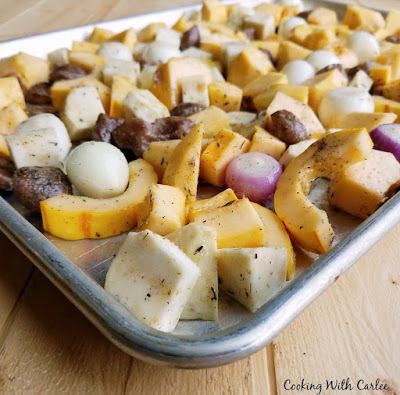 Spread over the prepared sheet pan and roast for 20 minutes. Stir the vegetables and flip them over and roast for about another 20 minutes or to your desired level of doneness. Melt the butter and stir in the maple syrup and apple cider vinegar. 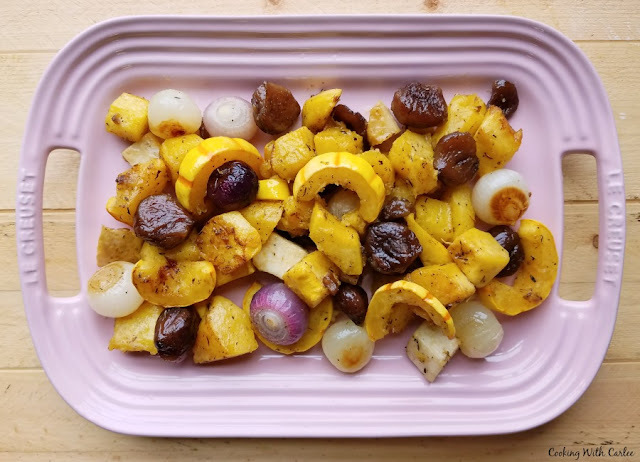 Toss the roasted veggies in the maple glaze and serve. While Spring produce seems to get the lion's share of attention - think pea shoots and fiddlehead ferns - Fall's fabulous produce is sandwiched between the glut of pumpkin recipes for Halloween and the sweets-heavy holiday season. So, this year, a dozen food bloggers have gathered to share recipes and ideas that celebrate the #FabulousFallBounty. Many thanks to our event sponsors: Silpat for a handy silicone mat; Le Creuset for a lovely serving platter; and Melissa's Produce for providing the bloggers with a beautiful box of goodies. A gorgeous side dish for any table, especially a Holiday table. Thank you, Wendy! I was really pleased with how the flavors came together! Oh, my goodness, Carlee! What a platter full of goodness you have there. Thanks for joining me in this adventure and I'm tickled that celery root and chestnuts have been added to the "approved" list. Thank you so much for putting this together and for changing our minds about chestnuts and celery root! That would make for a very royal side dish! 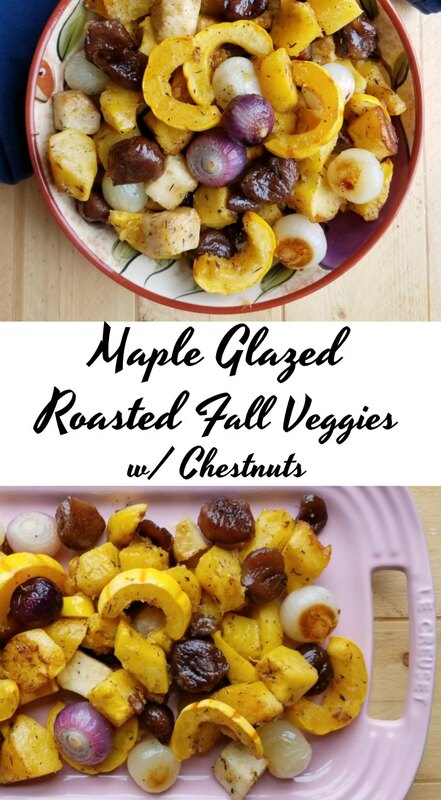 They look lovely..Roasted vegetables with buttery maple glaze just sound so wonderful! I love those pearl onions too..they look tad better than sliced ones! Don't the pearl onions make it feel a little extra special? Thanks, Deepika! Looks super yummy and I love that pink platter...I've been seeing it a lot of Instagram! It is popular all of the sudden! I love it too! Yummm! Looks so delish and healthy. It is soooo good and definitely packs in the nutrition. Thank you! This is sure my kind of side dish, it looks delicious! Thanks so much for sharing with us at our Thanksgiving Edition of Full Plate Thursday! Hope you have a great week and come back soon! It's mine too, delicious, nutritious and mostly healthy but a little bit naughty ;-) Thanks! HiCarlee, another tasty sounding dish. I do like roasted veggies, I usually roast them in honey and balsamic. Chestnuts are a popular food here now, but I'm not overly keen either, maybe I should try steamimg and roasting like this too. 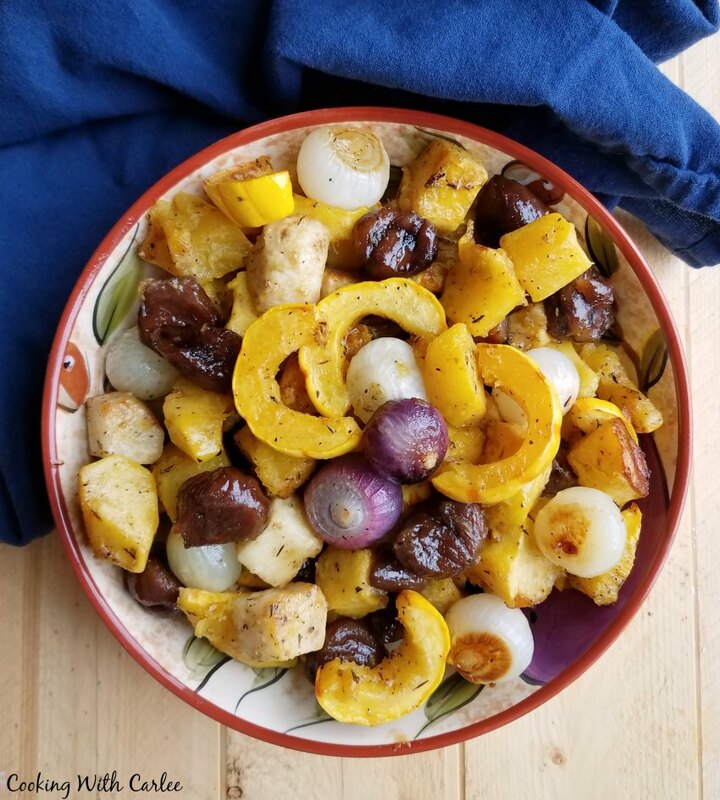 Honey and balsamic roasted veggies sound delicious! I am going to have to do that next time! These roasted veggies look amazing!!! Me too! Roasting automatically makes it a little bit better! Nice combo and the bowl looks yum! Pinned! Looks so good! Thanks for sharing at the What's for Dinner party!